We’ve been busy little event organizers here at Viget lately, with a couple of iPhone Hack Days (one at each office) and Developer Day Boston all coming in the last several weeks. In case you missed ‘em, here’s how things went down. We’ve been seeing a lot of interest in iPhone development, both from clients and from developers - and there is a flurry of activity going on in the framework space, with Rhomobile, PhoneGap, Titanium, and more all competing to make iPhone development easier. It made perfect sense, then, for me to run a couple of half-day-ish workshops on the platform, both introducing Objective-C and the process for creating native apps (and walking people through the code for my own application in the process), and digging in deeper to a couple of the frameworks. 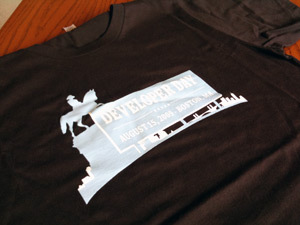 Every Developer Day adds a little something to the previous ones, and Boston was no exception. We started videotaping talks, and after some review we’re hoping to post them publicly. This is also the first Day where we had shirts for the attendees - take a look! Plans for the next Developer Day are underway, so keep watching the web site for details - and a new design, coming very soon.